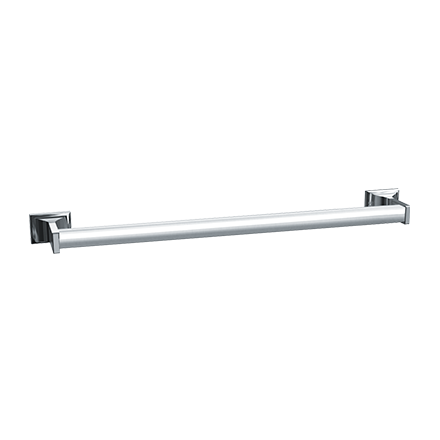 Towel Bar Unit shall has triple chrome plated rust proof Zamak brackets. Bar is 3/4′′ diameter (Ø19) 21 gauge (.032 in.< .81> wall) triple chrome plated steel tubing. Unit is mounted by two end brackets. Tapped holes in bracket flange base have tamper resistant stainless steel slotted headless set screws to lock brackets to concealed pre-mounted wall plates. Unit meets appropriate FHA and other Federal Specifications. Triple chrome plated steel tubing available in lengths: 18″, 24″, 30″ and 36″ (457, 610, 762 and 914 mm) long.